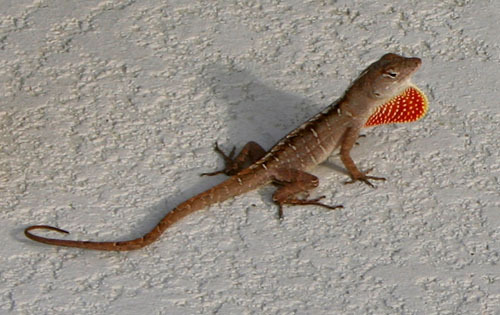 Brown Anole is a Lizard species indigenous to the Bahamas and Cuba. Belonging to the Polychrotidae family and the Anolis genus, it has also been introduced in many US states. The lizard is quite popular as pet as it is very easy to take care of. Size: They can grow anywhere between 12 cm and 21 cm (5 inches and 8.5 inches) in length. The Males are generally larger than the females. Weight: Male Brown Anoles weigh between 6 gm and 8 gm, while the females are generally 3 gm to 4 gm in weight. Color: Their color ranges from brown to gray with the backs marked with yellowish or pale white patterns. The females have a light-colored line running down their dorsal sides. Throat: They have red or orange extensible throat fans or dewlaps with a distinct white border. It is one of the principal distinguishing features of this species. Tail: Their dark-colored tails are laterally compressed. Apart from their native range of the Bahamas and Cuba, the brown anole was introduced in the southern regions of Florida, United States from the Caribbean Islands. Since then, the distribution range of this invasive species has extended to various US states including Texas, Georgia, California and Hawaii. They are also found in Taiwan, China. They are considered semi-arboreal, living both on trees and on ground, with warm and sunny climates being ideal for them. Their diet consists of various insects including grasshoppers, spiders, crickets, cockroaches, wax worms and mealworms. They may also feed on smaller Lizard species like the green anoles and their eggs. Populations living near water feed on arthropods and small fishes as well. They like to spend their time sitting on tree branches or rocks, basking in sunlight. The males are quite territorial, often fighting with each other for protecting their home range. The lizards remain active during daytime, especially in warm weathers. They tend to hide under tree barks and inside rotten logs, alone or in groups, when the weather is cold. They are quite aggressive in nature, with the males being more aggressive than the females. The lizards are able to inflict a painful bite if cornered. Males often bob their heads and move in a manner (as if they are doing push-ups) when angry. The same behavior is displayed for finding suitable mates. They generally stay very alert, even at night, making it a little easier for them to avoid being preyed on. Various large rat, bird and snake species are known to prey on them. They have a special defense mechanism that allows them to shed their tails immediately if they are captured by it. 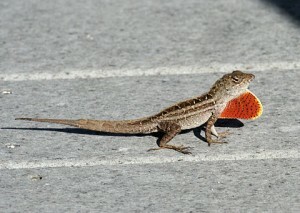 The lizards are able to run at fast speeds, making it easier for them to catch prey or avoid enemies. They can cover long distances in a single leap. Being excellent climbers, they can climb any type of surface at a blinding speed. Unlike many other reptiles, the brown anole shed their skin in multiple small pieces. They often eat the molted skin which supplies them with additional calcium. The shed skin may stick to their body in extremely low humidity levels, leading to serious health problems. Mating takes place during the warmer months, between late spring and early summer. They become reproductively mature at 1 year of age. 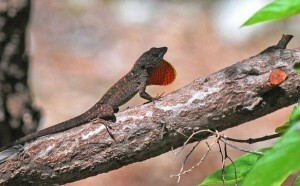 The male Lizards display their dewlaps for attracting females. The females lay eggs several times within a single year with each clutch containing 1 to 2 eggs. 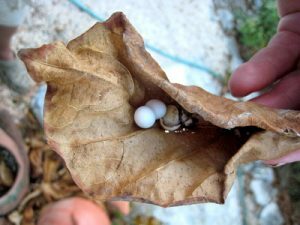 The eggs may be laid among heaps of decaying leaves or on large trees branches or then can be kept buried is moist soil. The changing summer and winter temperatures are important for their reproduction. The white, hard-shelled eggs take take 40 to 60 days to hatch. Brown anole hatchlings start eating 3 days after their birth. The young lizards leave their parents’ nest to establish their own territory shortly after hatching. Average lifespan of this species is 3 to 4 years. There are a few things to keep in mind to have one of these lizards as a pet. Here is some important information about their housing, feeding and caring in captivity. Housing: A 2 ftx2 ft tank is ideal for a single anole. It is ideal to use a full-screen or screen-top glass aquarium. The semi-arboreal lizard needs plenty of space to move freely. Make sure to place real plants and vines in the tank to provide it with its natural habitat. Substrate: A potting soil mixture works well as the tank substrate with a sheet of bark chips on the top. Temperature: The daytime temperature of the tank should be around 85 °F, while it is important to keep the temperature around 75 °F during night. Lighting: Full-spectrum UVB lighting is required for its proper health. 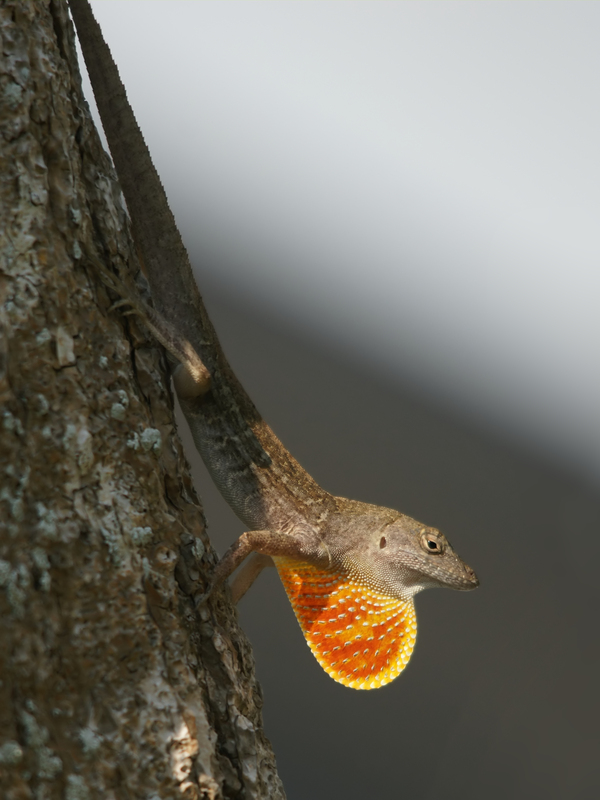 This allows the Brown Anole to produce the necessary vitamin D3. Feeding: Their diet in captivity may include regular lizard foods like crickets, wax worms and mealworms. It is not advisable to feed these medium lizards with insects too large for their own size. Handling: This reptile is not poisonous. But, it is advisable not to handle your pet unless absolutely necessary as it does not like to be cuddled. Make sure to wash the hands properly with disinfectant soap after handling the pet or the contents of its tank. This species is included in the “Least Concern” category by the IUCN. Their shed tail thrashes about violently to distract the predators, giving the lizards a chance to make their escape without being chased. The brown anoles are often confused with another species called green anoles, despite having shorter snouts compared to the latter. The green-brown coloration of the green anoles helps with the distinction. In some areas of their distribution the brown and green anole populations live on the same tree, with the latter inhabiting the higher branches, while the former remain in the lower branches. 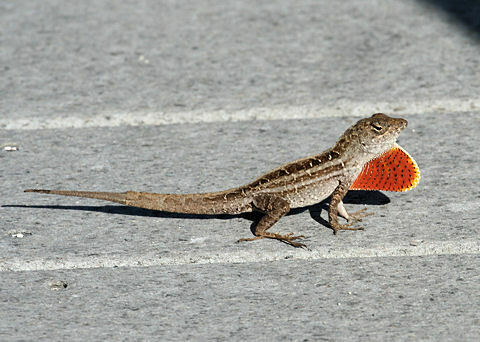 Hey this a great article about the brown anole. Thanks for the great content in this article it helped me a lot ! Can they eat dead crickets?